At first glance, it’s hard to know what to make of Helen Frankenthaler’s heaving, atmospheric painting, The Bay. We see an imposing fluid blue promontory suspended in front of us. Its colors ranging from violet to indigo run into one another with a clear zone of navy near the top of the canvas that draw our eyes up to it. The blurring of the colors gives an immediate sense of the artist’s process: paint poured onto the canvas when it was wet. We can almost watch as the blues meld into one another during this early stage giving the image its blurred and smooth finish. Is its subject what the title suggests—a landform of some kind with certain emblematic associations? Is the swelling amorphous blue mass floating amid that moss green and cream border meant to stand for something beyond itself? With many Abstract Expressionist paintings of the 1950s and 60s, it’s important not to get too caught up with possible social and historical contexts and biography, but to focus on what’s before us—the physical elements of the work itself because those elements can tell us so much about the painting. 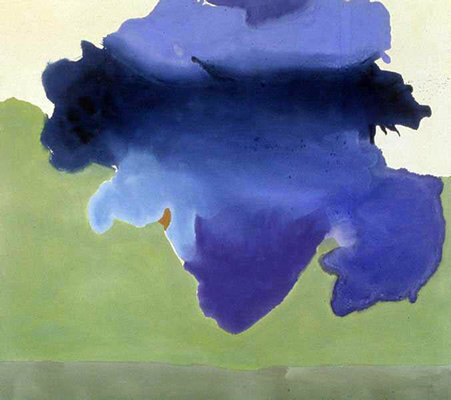 When Helen Frankenthaler painted The Bay, she was already a well-regarded artist. She’d been the subject of a LIFE Magazine profile in 1956 and was one of the handful of women among the traditional all-boys’ club of the New York Abstract Expressionists. The Bay was chosen as one of the paintings for the American pavilion of the 1966 Venice Biennale. Looking closely you can see that the shades of blues that run into one another are part of a specific process of pouring paint on to the canvas rather than painting the colors onto the surface with a brush, as the leading Abstract Expressionist painters, like Jackson Pollock, Willem de Kooning, and Franz Kline, were so famous for doing. Frankenthaler’s approach here was to use a soak-stain method with diluted acrylic paint. Acrylics gave her more flexibility with viscosity and movement than oils, and allowed her more control as she poured that thinned paint onto the taut unprimed canvas so that it would get absorbed into the weave of the fabric. As a substitute for the action of the brush, Frankenthaler would lift the canvas and tilt it at various angles so that the paint would flow across the surface. She had to account for gravity and the ebb and flow of a liquid across a flat surface, so a fascinating aspect of Frankenthaler’s method is the blend of the artist’s control paired with the unpredictability of the forces of nature. This kind of painting is often classified as Color Field painting, painting characterized by simplicity of line and a focus on color as the subject rather than as an add-on. 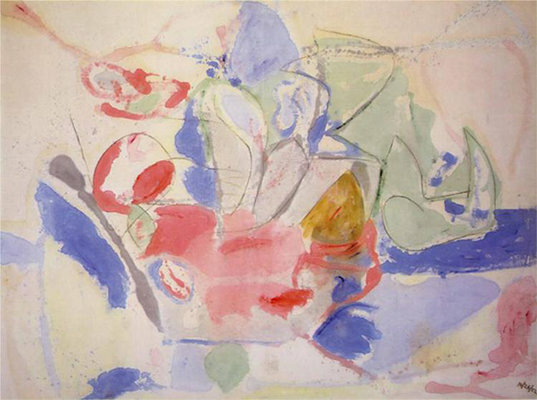 The first generation of Abstract Expressionists, Mark Rothko and Barnett Newman were the first important Color Field painters, while Helen Frankenthaler is often classified as a second-generation member of the group. Frankenthaler was inspired by the drip method of Jackson Pollock who began painting on the floor in the late 1940s, but she knew she wanted to work differently. Pollock and other artists such as de Kooning and Franz Kline had made the painted gesture too famous and recognizable by the early 1950s. In 1952, at the age of 23, Frankenthaler’s experiments lead her to produce her first major painting, Mountains and Sea, an expansive luminous depiction of the landscape of Nova Scotia, where she’d recently taken a holiday. Mountains and Sea in turn inspired other painters to use this soak-stain method to great success, painters like Kenneth Noland, Morris Louis and Paul Feeley, whose canvases of floating thinned color heralded in a new era of abstract painting. The sense of natural spontaneity and devotion to color is part of what makes The Bay and the work of the Color Field painters so compelling. The basic formal elements of a painting speak for themselves as the viewer experiences the work in a fundamental, direct manner. The influential mid-20th century art critic, Clement Greenberg, a close friend of Frankenthaler (and Pollock), believed that if art made after the trauma of the second world war was going to have any real impact on the social consciousness of Americans it would have to radically change and move towards the abstract. For Greenberg, abstraction could reach a more universal and expansive mode of visual communication. When you first saw a Cubist or Impressionist picture there was a whole way of instructing the eye or the subconscious. Dabs of color had to stand for real things. It was an abstraction of a guitar or a hillside. The opposite is going on now. If you have bands of blue, green and pink, the mind doesn’t think sky, grass and flesh. These are colors and the question is what are they doing with themselves and with each other. Sentiment and nuance are being squeezed out. That last sentence, “sentiment and nuance are being squeezed out,” is crucial. The colors on the canvas don’t have to represent something in particular, but can have a more ambiguous, emblematic quality for the viewer. The basic act of responding to color, the way one would respond to a sunset, or to light from a stained-glass window, simplicity and pure emotion through clarity of color and form. The same year she painted The Bay, Frankenthaler painted a series of similar soak-stain paintings with titles referring to water and geography: Canal, Low Tide, Blue Tide, inspired by the landscape of her country home in Provincetown, Massachusetts. As Frankenthaler said, it’s important for us not to be too encumbered by context and speculation when we look at her work. We’re to take from it what we will on our own terms. Cite this page as: Farisa Khalid, "Helen Frankenthaler, The Bay," in Smarthistory, August 9, 2015, accessed April 21, 2019, https://smarthistory.org/frankenthaler-the-bay/.